It's easy to forget about Microsoft in this market -- but this tech giant is quietly rampaging higher, with room for even more upside in 2017. In 2017, a lot of investor attention has been on the FAANG stocks -- the group of stocks made up of Facebook (FB - Get Report) , Apple (AAPL - Get Report) , Amazon (AMZN - Get Report) , Netflix (NFLX - Get Report) and Google's (GOOG - Get Report) (GOOGL - Get Report) parent company Alphabet. And for good reason too -- the FAANGs have produced some impressive performance numbers year-to-date, leaving most other stocks in the dust. While, to those five, stocks have been serial outperformers in 2017, they're not the only stocks in the technology sector generating sizable gains. One other tech giant that hasn't been lumped into that group should be on investors' radar: I'm talking about Microsoft Corp. (MSFT - Get Report) . Microsoft has produced some FAANG-like outperformance in 2017, charging approximately 34% higher since the calendar flipped to January. That rally got accelerated back in late October, when the firm reported first-quarter earnings that beat Wall Street's expectations, triggering a 6.5% gap higher in Microsoft that day. But don't worry if you've missed that move in Microsoft -- the price action is signaling that there's even more upside potential left in this stock. You don't need to be an expert trader to figure out Microsoft's price trajectory year-to-date: this stock has been moving up and to the right in a well-defined trend channel, a price pattern that's about as simple as they come. 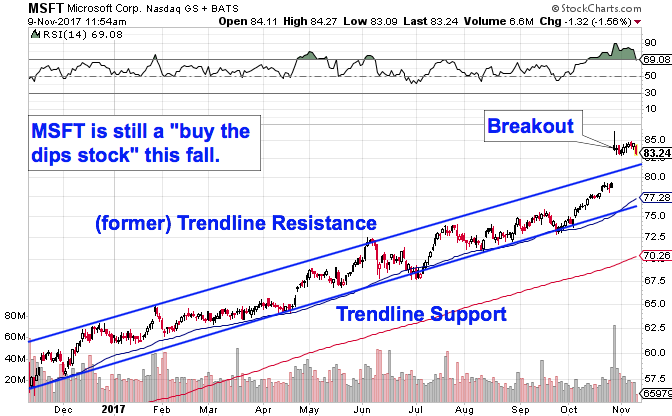 Microsoft's uptrend took a turn for the better with the aforementioned earnings breakout at the end of October. That move didn't just send shares higher -- it actually blasted MSFT through the top of its trend channel, accelerating the trend that's been in play all year long. In the intervening weeks, MSFT has tracked sideways, bleeding off some overbought momentum from its up-move. That sideways consolidation is a good thing -- it effectively gives buyers a chance to "catch their breath" after Microsoft's earnings gap higher. Relative strength, an indication of how MSFT is faring relative to the rest of the broad market, continues to rally in a well-defined uptrend of its own. That's a signal that Microsoft's outperformance isn't showing any signs of slowing this year. The 50-day moving average has acted like a good proxy for trendline support in MSFT, and that makes it a logical place to park a protective stop if you decide to pull the trigger on this trade. Microsoft is still a "buy the dips stock" this fall, and Thursday's dip looks like as good an opportunity as any to be a buyer. Action Alerts PLUS, which Cramer manages as a charitable trust, is long FB, AAPL and GOOGL.